Learn about all the different programs and services Nashville Humane has to offer! The Nashville Humane Association (NHA) places more than 4,020 healthy and temperamentally sound animals into loving, forever homes each year! Animals are available for adoption at our state-of-the art facility, as well as on our traveling adoption unit: Teddy’s Wagon. ROVER, our “Big Yellow Bus,” travels throughout Davidson County to providing spay and neuter surgery for those who wish to have their pets altered, yet can’t afford it. ROVER’s mission is to educate the community about proper pet care, in an effort to keep Davidson County pets healthy and decrease the number of unwanted animals. Prison Puppies Achieving Worthy Service (PPAWS) is a program in cooperation with Nashville Humane Association and Corporate Corrections of America (CCA). In this program, dogs waiting for adoption at Nashville Humane Association are sent to the prison for a 6-week stay, where they are trained by inmates under the direction of the Animal Behavior Program Manager at Nashville Humane Association. A team cares for and teaches a dog basic manners, including loose leash walking, sit, down, stay, and wait at the door. These dogs are also housetrained and crate trained, while being socialized with other inmates, officers, and staff at the facility. Upon graduation from the program, dogs return to Nashville Humane Association to find their forever home with some life skills under their collar. Please feel free to call Nashville Humane Association at 615.352.1010 or visit 213 Oceola Avenue to find out which current shelter dogs are PPAWS graduates. Nashville Humane Association personnel travel throughout Davidson County, visiting schools, civic groups and more, to teach animal safety, responsible pet ownership and humane treatment for all living creatures. We also welcome groups to the facility for interactive lessons, educating them on the important role NHA serves in our community, as well as the benefits of pet ownership. Additionally, NHA has two educational summer programs for children: Critter Camp. These series of educational activities for children teach proper pet ownership, how to be a good neighbor, careers in animal welfare, dog bite prevention and more. These programs welcome the participation of other agencies such as the Nashville Zoo, Nashville K-9 and Walden’s Puddle. NHA staff and volunteers travel to assisted-living facilities on Wednesdays, in an effort to bring smiles and comfort to those that do not have the constant companionship of animals due to illness, age or living situations. Research shows that relationships with animals have a positive influence on health. Interacting with pets can lower blood pressure, reduce stress, decrease lonliness and enhance feelings of well-being. In November 2008, NHA opened the Community Pet Food Bank to support the growing needs of our community. With the declining economy, many families and individuals have been unable to care for their pets and forced to surrender them to shelters. The pet food bank assists those in need by providing supplemental pet food and supplies. This program has served more than 500 households and 750+ animals. The program is volunteer run, accounting for 250 plus hours of service annually. Many children’s organizations, such as Girl Scouts and Boy Scouts have toured the NHA facility to learn about proper care for animals. These visits often result in further research and outreach projects for these organizations. 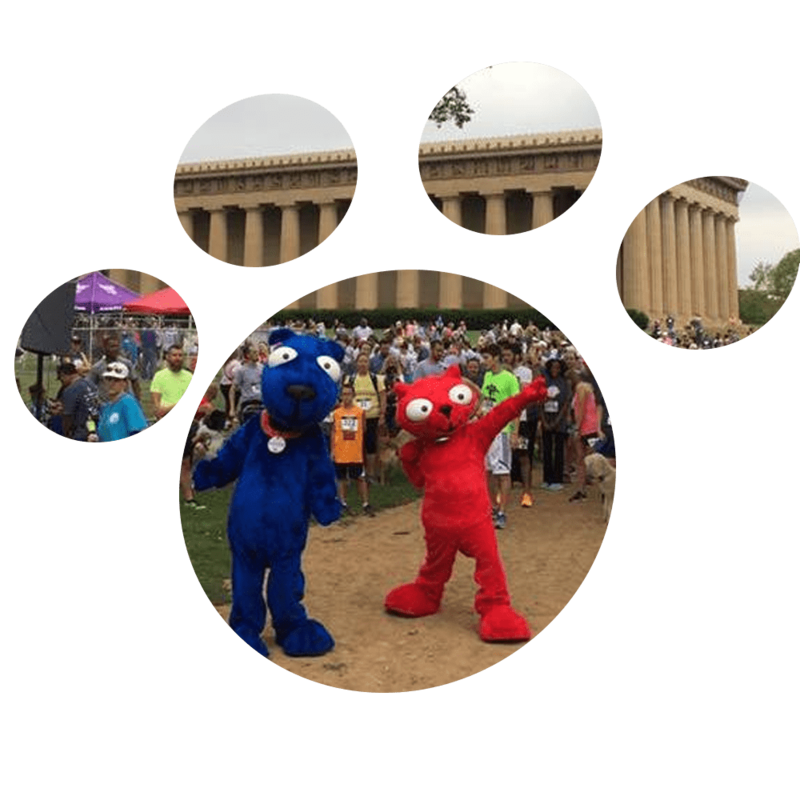 If you are intersted in having our Rover and Fluffy Mascots at your event, please contact Sherrie Hession at 615-352-1010.